Join us for another great outdoor event, free to the public as usual! 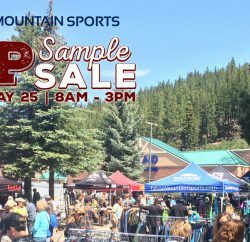 On Saturday, July 19, from 8:30 a.m. to 12:30 p.m., leading footwear brands Salomon, Merrell, La Sportiva, Scarpa and Darn Tough will be on the Mt. 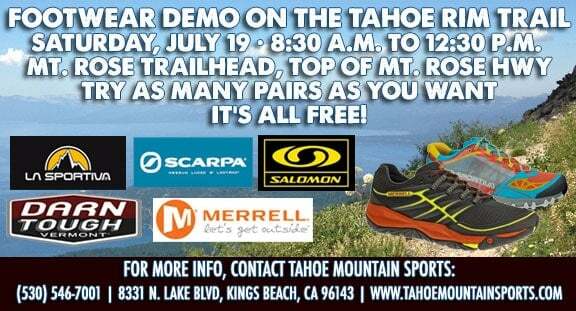 Rose portion of the Tahoe Rim Trail, and you can demo as many pairs of this year’s best trail shoes as you’d like; it’s all free! What is this ‘Trail Challenge’ we speak of? “The 2nd Annual Tahoe Rim Trail Challenge continues to build momentum as over 350 hikers, bikers and equestrians and five large Reno-Tahoe based corporations engage their employees in the 2014 Tahoe Rim Trail Challenge,” said Shannon Sakrit of the Tahoe Rim Trail Association. 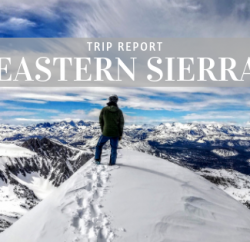 “The program has inspired both novice and seasoned trail users from the Reno-Tahoe and Sacramento-Bay areas to begin tackling small sections of the Tahoe Rim Trails through six day hikes along the 165-mile Tahoe Rim Trail. Participants socialize by sharing their on-trail experiences, stories, [and] pictures on the interactive, Tahoe Rim Trail Community.” Visit www.tahoerimtrail.org for more information or to register for the Challenge. It is NOT necessary to register for this TMS Footwear Demo. You don’t want to miss this free event! 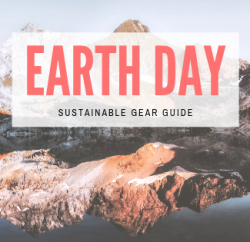 It’s not often you get the best off-road footwear brands in the same place at the same time, let alone with FREE demo shoes for everyone. 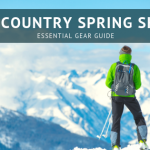 Previous PostBeautiful Spring Imagery from Tahoe and the Sierra Nevada Next PostGluten-Free Camping & Backpacking Foods - They're Grrreat!